Fronius Smart Meter 63A-1 SAVE MORE (installed prices). Perth WA. 1 x Fronius Smart Meter 63A-1 energy monitor. View energy import and export data. Fronius Solar.web online monitoring software & apps. Full installation, commissioning & network integration. The perfect accompanayment for any single-phase Fronius inverter system. The Fronius Smar Meter 63A-1 opens up greater energy insight into your Fronius solar.web online monitoring portal. 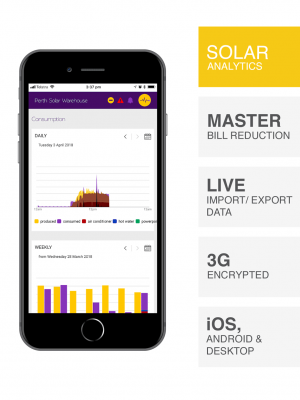 Your solar inverter builds solar production data. 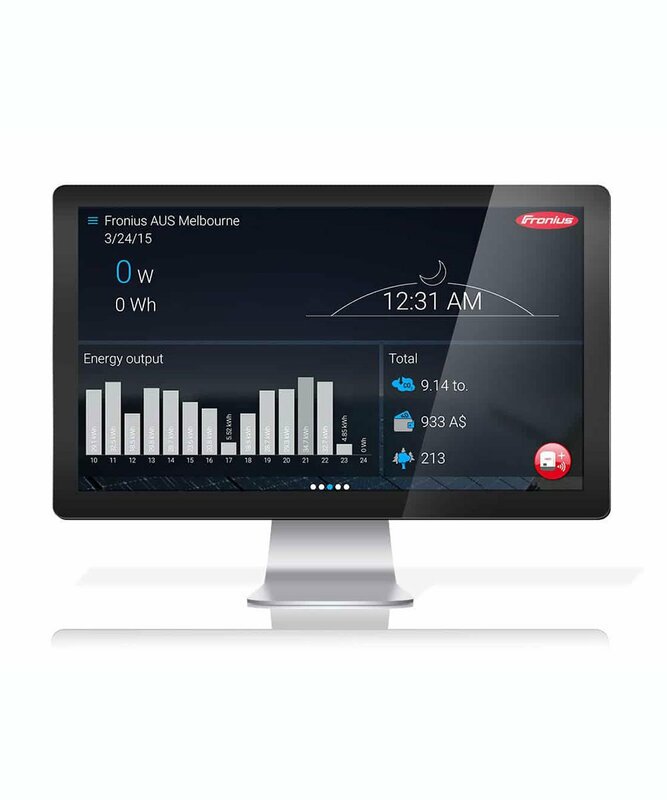 The Fronius Smart 63A-1 produces energy import and export data. Combining the 2 data elements facilitates greater energy saving opportunities. 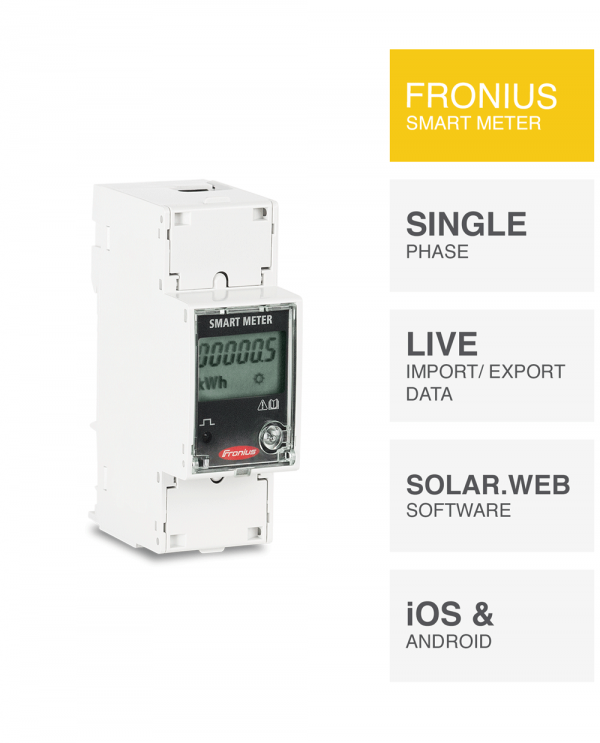 Equipped with a secure ethernet connection direct to the Fronius solar inverter, the Fronius Smart Meter 63A-1 communicates to the Fronius Solar.web portal through the Fronius solar inverters wireless or wired internet connection. As a world-renowned manufacturer of hard-working electronic technologies for decades, the Fronius Smart Meter 63A-1 is built to perform seamlessly alongside your single-phase Fronius devices. PSW Life Support facilitates you with the ability to get the most from your Fronius Smart Meter 63-A and Solar.web portal. Superior technical support for life ensures you the ability for greater production every day. PSW Life Support, based in Perth. Global knowledge, localy based. A technical expert by your side, always. When you need the information required to deliver your energy profile on every smart device you own, the Fronius Smart Meter 63A-1 completes the entire picture. No solar energy system owner should ever be without a linked data energy import/export meter. It’s different to your utility smart meter. 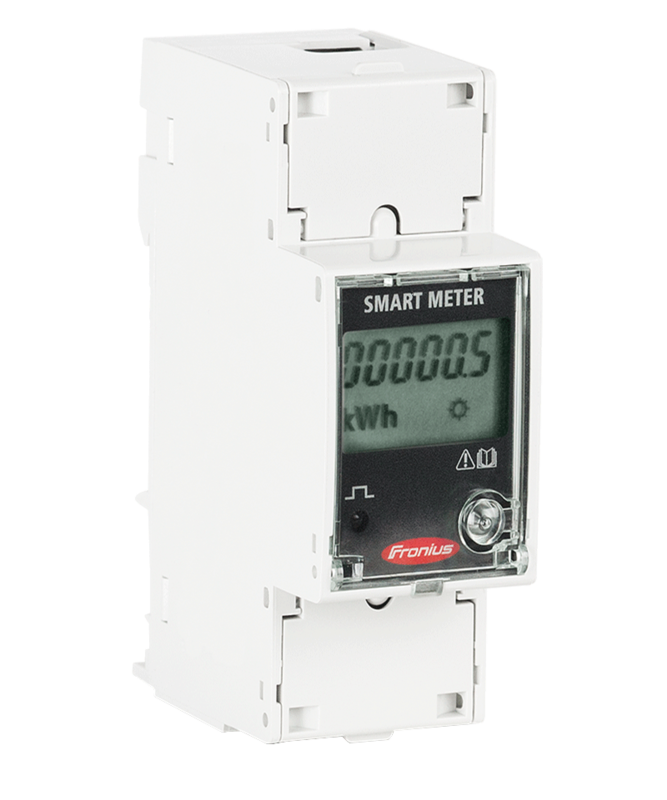 Unless you’re exceptionally consistent and like A LOT of manual data entry and spreadsheets, the Fronius Smart Meter 63A-1 is very different. Aided by your solar installations internet protocol (modem), receive real-time analytical power/grid supply insight and service messages in collaboration with your Fronius solar inverter readings. 100% Control. The information you require to make on the spot decisions for how you use your power supply. Such decisions affect your ability to save more energy through better solar energy utilisation. At the end of the day when considering solar monitoring, ask yourself… If you cant see energy import and export information in conjunction with your solar production data, what are you looking at? I had spent about a week to do my homework before I decided PSW to install our solar panels. We had installed 1.5kw solar system 8 years ago, luckily it lasted that long, but if not, I wouldn't have any idea where to chase for the warranty, as that company has disappeared. That's why it is important to choose a big and reputable company in the first place. That's what I thought. I have had several quotes, important to read the reviews from other people, that's why I had chosen PSW. Tony from the sales department is very friendly and efficient, he gives me a very honest quote via email, not bother me until I called him, best price from the beginning. He then came to my home talked to me, and we made the deal. Same time he talked to Penny-Lee, she said next week someone else has cancelled the installation appointment, so we were lucky to grab that opportunity. From our first conversation to finish, only 10 days! No hidden fees, they even removed my old panels for free! I have been told that the installation team will come between 8:30 to 9:00. On the day, their team arrived exactly on time at 8:30 am, Richard, Blake, and Dawson, three energetic young men, worked very hard, take their time to do an excellent job. Even not taking their lunch break! They finished at about 4 pm, tidy up everywhere, a perfect job. The team leader Richard suggested me to move the inverter to my carport to provide the shade. The previous one was next to the meter box, under the sun, the colour already badly faded. That meant extra work for the team, if he didn't say it, I wouldn't know it. That gesture shown they care about their customers. I am very impressed with the whole process, all the team members have done a great job. Fronius Galvo & Primo models (consult). PSW Energy optimised in-house installation. Full monitoring/ software configuration & network integration. Interest-free payment plans cannot be used in conjunction with sale prices and are issued on the RRP (recommended retail price) only. The PSW Energy Fronius Smart Meter 63A-1 is a single-phase device only and adaptable to selected Fronius solar inverters only. Additional restricted access installation costs may apply, a property assessment must be conducted and quoted. Should an existing solar energy system require alteration, additional installation costs may apply. A property assessment must be conducted and quoted. Listed price includes installation services to the following geographical location; installation zone >. For installations exceeding the mapped boundary, additional installation costs may apply. A property assessment must be conducted and quoted. GST is factored into the quoted price. No price is final until a site/ delivery evaluation has been conducted by PSW Energy (Perth Solar Warehouse) or its representatives and delivered in writing to the customer. All information on this page shall be interpreted in conjunction with the PSW Energy (Perth Solar Warehouse ) website terms and conditions. Full product terms and conditions are detailed in the quote and agreement should you decide to progress with this product. 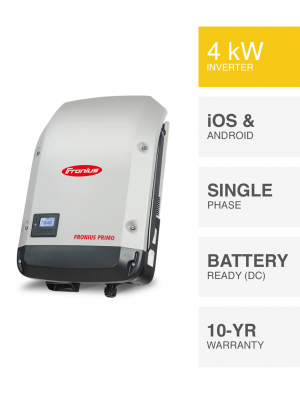 Fronius Primo 4kW solar inverter. Fronius Galvo 2.5kW solar inverter. 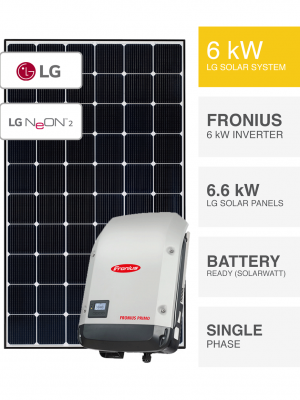 Fronius Primo 5kW solar inverter.